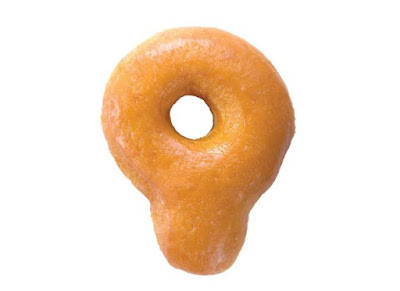 Dunkin' Donuts used to actually offer a donut called "The Dunkin' Donut" and it came with a handle that you could hold onto to dunk the donut in your coffee (per the chain's name). Now dunking a donut in coffee doesn't quite hold the popularity that it used to (and is more difficult these days due to the tall and narrow to-go cups that coffee tends to be served in now), but back in the day, you'd actually sit down with a wide-rimmed cup of coffee that was a perfect fit to ease your donut in. The chain didn't initially offer the donut when it first started. So how did the donut with a handle come to be? The Johnny referenced here is Johnny Spartos, who was one of the men running the original Dunkin' Donuts location in Quincy, MA for William Rosenberg. So what happen to The Dunkin' Donut? Well, it was discontinued back in 2003 because it had to be cut by hand and was replaced by a handle-less old-fashioned donut that was cut by machine. By this time, it was actually easier to dunk the handle than the donut into your coffee, so that might have played into it as well. I guess you could say it was an old-fashioned donut for an old-fashioned era. While you can't get the original Dunkin' Donut anymore, if you're willing to travel, you can still get a Dunkin' Donut with a similar handle (pictured above) over in Singapore (in several varieties to boot). It's a bit different from the original though, which by accounts, was an old-fashioned donut while the Singapore version is a yeast donut. Image via Dunkin' Donuts Singapore.